To say that this quilt was a challenge is an understatement! 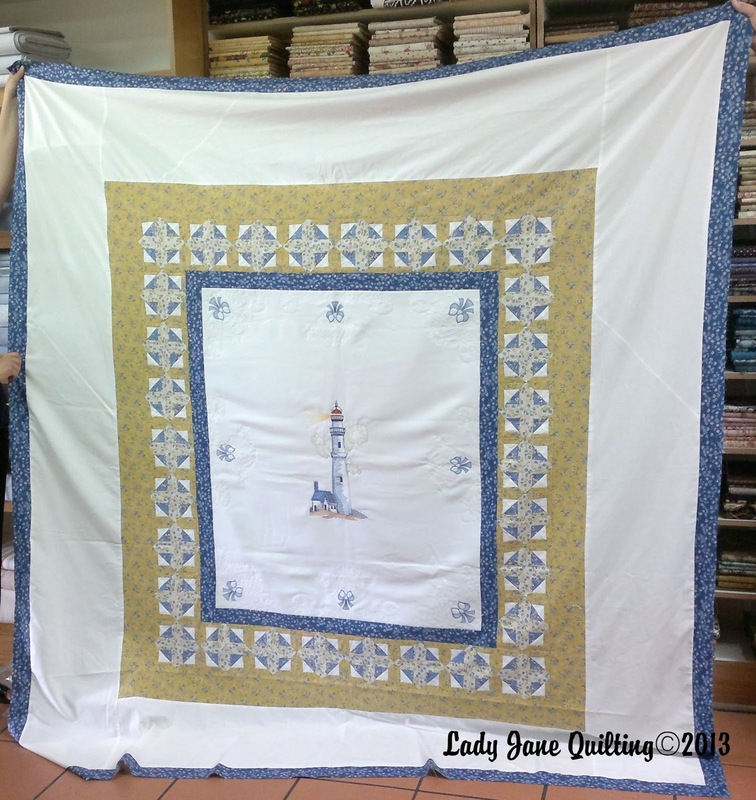 The Clients’ sister gifted her the embroidered centre panel. Christa came to me to help her design and make a quilt of this panel. This is what we came up with. It’s meant to fit a queen size bed. It has 12″ wide white border and the initial intention was that she would do some applique work on it after I have quilted it. But when this quilt was on the frame I decided to so something different in that border. Needless to say, the quilt had more blue fabric pen marking on that thread! Did I mention that this was Christa first attempt at quilt making? I dropped her in the deep end…with paper piecing! But she did very well. I have decided on a double layer of batting, 1 x polyester and 1 x cotton blend. The centre panel already had a layer of poly batting behind. So that made for a very puffy centre panel. Speaking of the centre panel, it was embroidered on a stretch fabric! Oh my word! 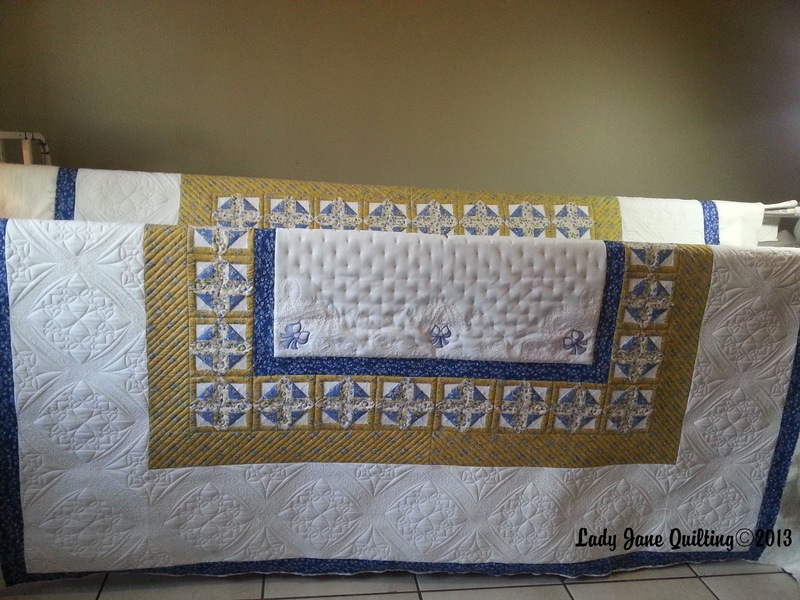 I could not quilt on it without any pleats or puckers. So I have opted for a ‘thread pin’ (as I call it) to keep everything in place. I think it looks good. Sjoe! This was a BIG one! So very pretty~! I am having the best time surfing back through your blog. 🙂 Do you happen to remember what thread you used on the white portion? I love the effect. 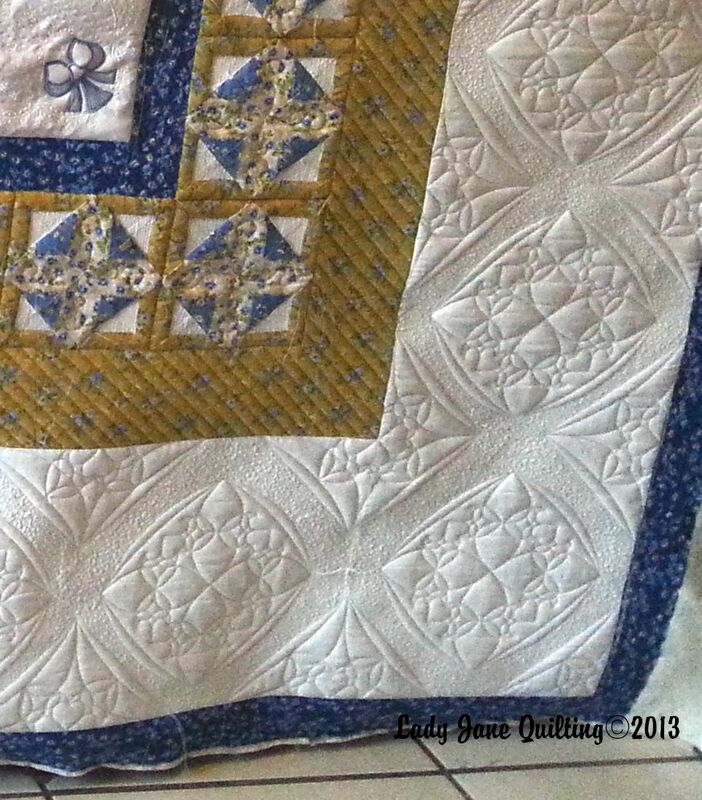 LynCC, on this particular quilt I have used Mettler Seralene White. It's a very thin, strong, polyester thread.